In the 10th grade section of the National K-12 championships, Alexander Heimann and Marc Arnold tied for first place with a score of 6.5/7. In the 11th grade section, both Abby Marshall and Jeffrey Haskel came back from early round losses to share first place with 6 points. In the 12th grade section, Toby Boas took clear first place, despite losing his last round game. Complete tournament results are available here. The 2008 National K-12 Championships, better known as "grade nationals," are ongoing in Lake Buena Vista, Florida. One of the more interesting sections is the 10th grade division. At present, Mark Arnold (USCF 2424) and Alexander Heimann (2312) are tied for first with 4.5 points from the first 5 rounds. Five other players are just half a point back. Chess Life Online has some photos here. In addition, MonRoi has coverage here. 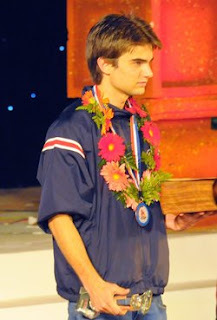 The 28-player U.S. squad at the 2008 World Youth Chess Championships in Vung Tau, Vietnam did quite well, including bronze medals for Sam Shankland and Darwin Yang, as well as an international master title for Shankland. As a treat for our readers, Darwin annotates his victory over the eventual winner of his section. 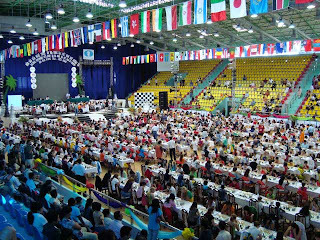 The inaugural edition of the Mind Sport Games took place in Beijing. Although not a scholastic event, up-and-coming teenager Abby Marshall was one of the U.S. participants. Her fascinating game against her Swedish opponent is included below. The full column can be read here. 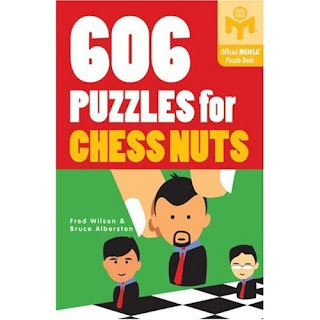 606 Puzzles for Chess Nuts is quite a nice book to spend time with, whether it’s five minutes at a time, or an hour or more. The diagrams are large and clear, two per page, and the authors have come up with a nice variety of realistic positions to ponder. It would appear that the book is especially suited for the “advanced beginner” and the “intermediate player.” The “tournament player” will be challenged as well, although I would have preferred in this chapter that hints (removing the guard, pin, fork, etc.) not be provided. For this reason, I might suggest Practical Chess Exercises, by Ray Cheng, for the more advanced player. Cheng’s book also has the advantage of providing answers on the facing page, whereas Wilson and Alberston have the answers at the back of the book, requiring the reader to constantly flip back and forth. For the really serious player, get The ChessCafe Puzzle Book 2. 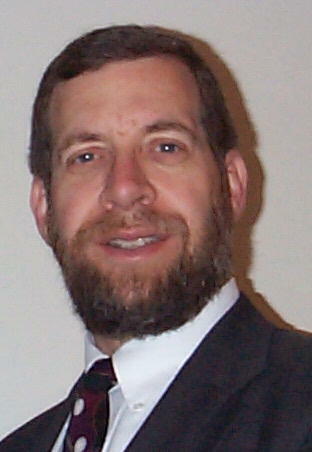 Jennifer Shahade has a wonderful piece about new IM Sam Shankland at Chess Life Online. It consists of an encompassing interview with the bronze-medal winner from the recent 2008 World Youth Chess Championships in Vietnam, as well as, remarkably, all eleven of Sam's games at the WYCC, all annotated by Sam. It's a treasure!